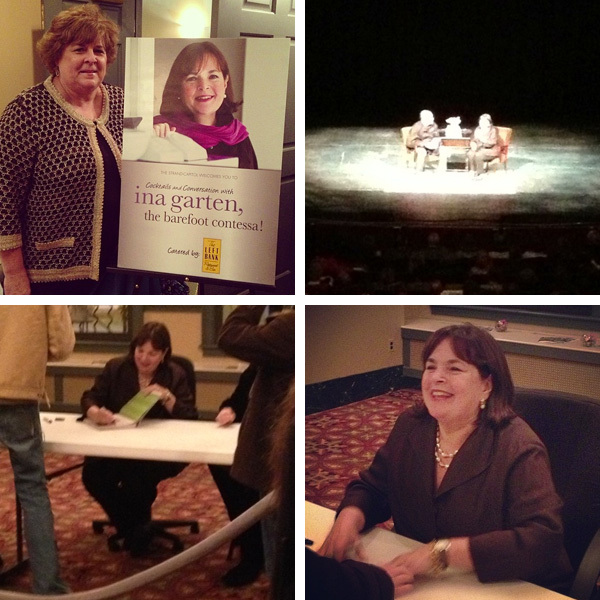 Last Wednesday night, my mother and I attended a sold-out event at the Strand Capitol in York: An Evening with Ina Garten. I knew the The Barefoot Contessa was a popular Food Network chef and an accomplished cookbook author, but I really had no idea until last week that she was so beloved! The event was a bit disorganized with ushers scrambling to get microphones to people with questions, and the acoustics made it difficult for all of us — especially Ina, I am sure — to hear. But I appreciate the desire to create an intimate atmosphere. And we did get to hear Ina talk about her favorite cafes in Paris, what she means by “good olive oil,” and her most memorable dinner party guests. Following the conversation, Ina stayed to sign books. My mom and I skipped out of the last interview question and ended up 16th in line. Good thing because we heard she was only signing 300 books — and there were over 1,000 in attendance! After “meeting” Ina (staff members very quickly ushered us past her table) and with signed copies of her new cookbook in hand, Mom and I headed down the street to the Left Bank for dessert. Such a fun mother-daughter night out! Ina’s new book, Foolproof, is all about entertaining with ease. It includes recipes “you can trust” to be simple and to impress family and friends and guests. Perfect timing considering that Nick and I hosted a small dinner party on Saturday night. There are a few recipes in our repertoire that we love to make for company: Sweet Potato and Apple Soup; Mustard-Baked Chicken with Pretzel Crust; Roasted Butternut Squash Orzo; Carrot Cake. On this particular night, we chose our favorite Lasagna with Nick’s Focaccia Bread and Truffle Brownies for dessert. And for an easy appetizer, I looked to The Barefoot Contessa. 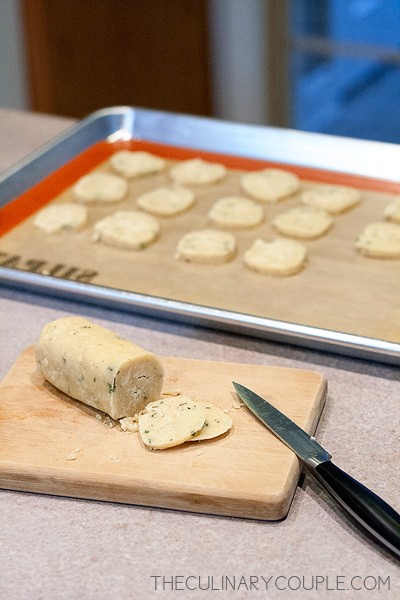 Ina’s Parmesan and Thyme Crackers take less than 15 minutes to prep and can be stored in the refrigerator until just before your guests arrive. 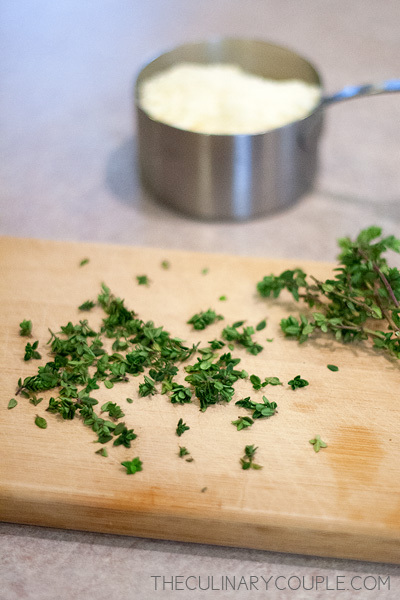 Combine butter, grated Parmesan cheese, minced fresh thyme, salt, pepper, and flour. Then roll it into a ~9-inch log. Wrap in plastic and refrigerate until about 30 minutes before your guest arrive. Then remove it and slice it into ~1/2-inch rounds. Bake at 350 degrees for 22 minutes until very lightly browned. 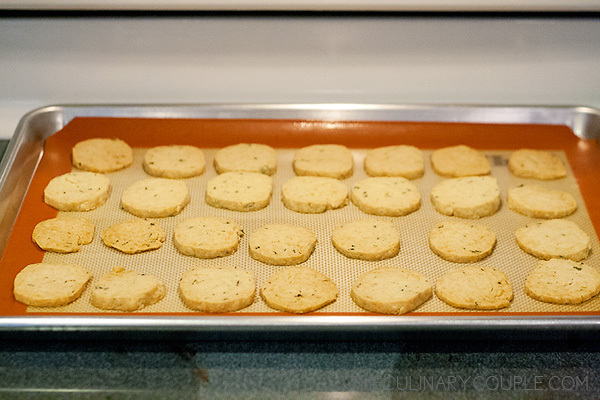 This recipe for Parmesan and Thyme crackers is from Barefoot Contessa: Back to Basics, which I also own. 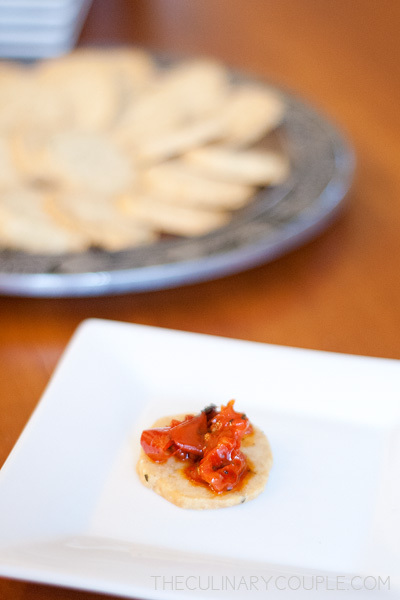 In Foolproof, she has a very similar recipe for Jalapeno Cheddar Crackers. I can’t wait to try them, along with … Caramelized Bacon; Penne alla Vecchia Bettola; Orange-Braised Carrots and Parsnips; Balsamic-Roasted Brussels Sprouts; Raspberry Crumble Bars; Cinnamon Baked Doughnuts; and more. What’s your favorite foolproof menu? In the bowl of an electric mixer fitted with the paddle attachment, cream the butter for 1 minute. 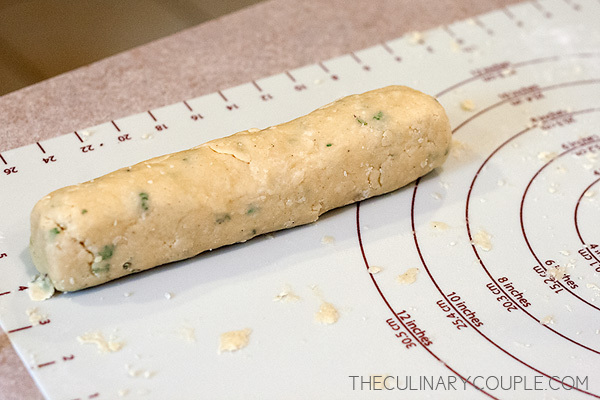 With the mixer on low speed, add the Parmesan, thyme, salt, and pepper; combine. 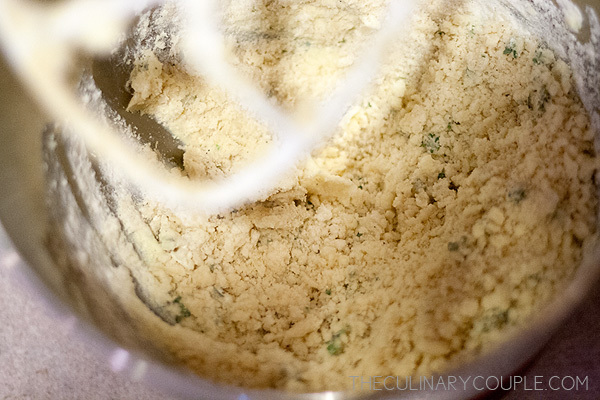 With the mixer still on low, add the flour and combine until the mixture is in large crumbles, about 1 minute. 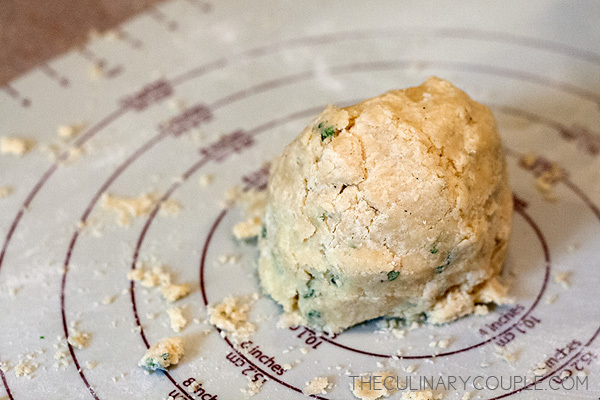 If the dough is too dry, add 1 teaspoon water. Meanwhile, preheat the oven to 350 degrees. Cut the log into 3/8-inch-thick rounds with a small, sharp knife, and place them on a sheet pan lined with parchment paper. Bake for 22 minutes, until very lightly browned. Rotate the pan once during baking. Cool and serve at room temperature. Oh wow, Ina is one of my food heroes. I have her Barefoot in Paris cookbook and her recipes are easy to follow. Her Barefoot Contessa episodes are on rerun here in the UK. I’d love to be at one of her dinner parties! How exciting that you met Ina! 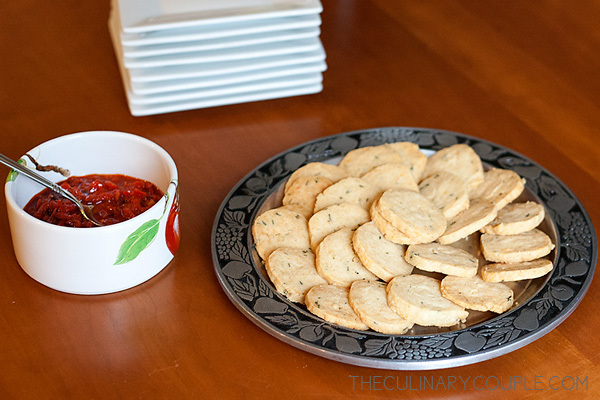 Your guests undoubtedly loved those homemade crackers – they look divine!